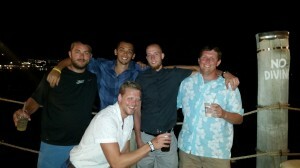 A Night Out at Seacrets! Among the locations we partner with, Ocean City, Maryland is at the top when it comes to LEGENDARY entertainment and great golf.This coastal location brings you the best in challenging courses, m0uth-watering seafood and the impossibility of having a dull time. Hit the links; take a swim, then clean up for some of the best nightlife on the East Coast. When you say that you are looking to take a trip to Ocean City, we know exactly what that means; you are looking for an unforgettable time. If you like the tall task of avoiding water hazards, then Ocean City golf is definitely for you and not for the faint of heart. Glen Riddle Golf Club brings you the best of both worlds by having two courses very different from one another. When you play “Man O’ War,” you enter into a realm of water hazards, potential cross winds and long holes. Playing “War Admiral,” it may take the edge off a slight degree. Being covered from the wind and having beautiful scenery, you still need to navigate correctly, but may be able to relax a little more. Venture just three short miles out of Ocean City to Eagles Landing and get the true feel of the shore. This course has wildlife, lush greenery and water all around that will bring out the best or worst of your game. A few other courses Ocean City boasts are Rum Pointe, Ocean City Golf & Yacht Club and the Bay Club East & West all of which are worth your attention when looking for Ocean City golf. Even if you do not enjoy seafood, rest assured Ocean City has the right place for you to chow down while on your golf trip. If you are however craving some fresh seafood, Phillip’s Seafood buffet is the kingfish of them all. You will not go hungry at this establishment, snow crab legs, crab imperial, a raw bar, clam bake, sautéed sea scallops and the list goes on and on. Not to mention, there is more than just seafood; you can find Maryland Fried Chicken and many other American dishes at Phillip’s. Looking for beachfront dining? Head on down to Macky’s Bayside Bar & Grill for a beautiful sight of the Ocean while eating delightful coastal fare. Maybe a little bit more hustle and bustle is your style, well, Shenanigan’s Irish Pub and Grille can be found right on the boardwalk. Out of every location that Genesis sends our LEGENDARY golf travelers to, Ocean City certainly is the top of the tower when it comes to nightlife. Seacret’s Night Club is one of the most popular spots to head to for food, drinks and fun and brings people in from all over the Mid-Atlantic. The Skye Bar is very modern spot found on Coastal Highway. Overlook the strip as you enjoy live entertainment and socialize with friends new and old. With miles and miles of free beach, more mini-golf courses than you can count, a bumpin’ boardwalk and even amusement parks, Ocean City truly is the happening spot to take a golf trip with your crew this summer. So let loose a little bit and give us a call so we can start planning this LEGENDARY golf experience for you and your group. This entry was posted in Genesis News & Opinions, Ocean City, Maryland, Summer Trips, Uncategorized. Bookmark the permalink.